Loved the whole experience. The hostess made us feel comfortable. They informed us about valet parking, the waiter was super attentive and gave great suggestions. The dessert was divine and the ambiance serene. They made our anniversary a night to remember. I would suggest this place to anyone with a sweet tooth, or just to sit and have conversation with a delightful cup of java. Love the cakes, cheesecakes, pies, and coffee specialties. The ambiance of the place makes you feel like being in a Parisian Cafe. A must to go when in Atlanta. A trip to Paris without leaving Atlanta! "Luxurious desserts and a Viennese ambience define Café Intermezzo as the place to go late at night or post-performance for a thoroughly wicked snack." The coffee and food are excellent here. The atmosphere makes you feel like you're in Europe and the staff is attentive and friendly. Definitely a staple spot in Atlanta. Many locals say this is the number one spot for dessert and coffee in Atlanta. A favorite with locals and tourists, the Midtown café is always busy. With a selection of 120 fresh cakes and pastries, you're sure to find one — or several — that you can't resist. The festive bar is a popular place to meet for drinks as well. Choose from among 70 wines, 36 coffee drinks, and 30 single-malt scotches. Dinner is available too, but that's just icing on the cake (so to speak) — for more than 20 years, the place has been known for its desserts! Great espresso, cakes, and cheesecake. I have yet to eat dinner at this location but if its at least equal to the one in the airport, then its a good start. The espresso is made by a real Italian machine and is always made to perfection. They have 50+ cakes and cheesecakes they rotate through on a daily basis. Friday and Saturday nights have an energized atmosphere or if your looking for a laid back experience go during the weekdays. One of the better cafe's in the ATL. Unlike others, they serve a nice selection of light foods and many delicious desserts. The staff was nice, service was excellent and the restrooms were clean. Perfect for Date Night. The atmosphere is very romantic, the perfect finishing touch to date night...for desserts and drinks. Amazing desserts...the black and white (dark and white chocolate) cake is amazing as well as the pineapple coconut cake! Beautiful location. The young man that took us to our table, very nice. We loved the French style, the food was excellent, the service was great, we had the best waitress. The dessert presentation by a young girl (sorry don't remember her name) was very nice....and the Tiramisu cheese cake the best. Was recommended by our daughter-in-law and will recommend it. Amazing experience! Loved the vibe to the place, the food was exquisite, the coffee selection it's insane and they're amazing! It's great for brunch, lunch or breakfast at any hour of the day. It gets crowded at evening and noisy, but other than that it's a top place to visit at ATL. The atmosphere of this place was beautiful and very chic, absolutely loved it. We sat outside and listened to classical music playing and just chatted about our lives. The decor was very stylish and reminded me of a French cafe. The lattes were AMAZING and the Nutella strawberry crepe I had was delicious! Will definitely be going back! I spent my happiest times here. I live away now but always make the trip. Café Intermezzo has the coolest espresso machine! A special place with the best coffees in the world! Always a treat when in Atlanta! Made our prom night very very special! And super delicious! Can't wait to go back for the cafe au lait. Wonderful Mother's Day experience. It was my friend's birthday and she was so happy to have dinner there for the first time. Cafe Intermezzo is more than just delicious desserts. You can enjoy brunch great coffee selection, wine and food. Great little lunch getaway. Just a bit further out from Colony Square and you get to quieter restaurants with a staff that isn't overwhelmed by a lunch crowd rush. Great atmosphere, service, food, and as always, stellar dessert bar. Always a great time at Cafe Intermezzo in Midtown! What a great way to enjoy a brunch! Fantastic service and lovely food!! This cafe has a full restaurant menu that also includes pastries, cocktails, teas, coffee, and other alcoholic drinks. It has a European feel. The coffee is great, so many choices but cannot go wrong. The chicken spinach crepes are amazing! And let's not talk about the fruit tarts imported from Italy, it's must! Love this place. Great coffee and alcoholic drinks and fantastic cakes. Come here for an after dinner nightcap, coffee, and dessert. Loved this cafe in midtown! It feels just like one you'd find in Europe with delicious cakes (try carrot cake!) and great atmosphere. The typical late-night sweet craving might involve doughnuts, but this place has such lovely pastries -- and a European coffee house feel. And the Midtown location (there are also Dunwoody, Alpharetta and Airport locations) is open nice and late for after-parties or impromptu celebrations. Wow, what a great place to indulge in dessert and drinks. The ladies got sweet martinis and the guys got bourbon drinks. The desserts were large and sweet. We had a great time and would come back again. Please note that the cheesecake and other pies were large enough to share so unless you are really hungry I would definitely split something if your tastebuds align. My wife loved the chocolate martini so much so I highly recommend trying it yourself. Love love Cafe Intermezzo! Great for breakfast, lunch, dinner or just a drink! Staying right next to door to this amazing cafe we visited almost every day and I can't wait to go back! The food is amazing, staff is friendly but the atmosphere is even better! This place is UNBEATABLE in town . It has many kinds of cake such as tiramisu, Oreo cheesecake, etc and I went there 3 times within a week. My first time was here. I was hooked. I was in love. I was ready to move in and change my last name.... The guy didn't last, but Intermezzo did. The hummus platter is fabulous. The soy lattes rock my happy vegan heart. I've come here on multiple occasions and gotten the most superior service. I'm a huge fan of the various cheesecake and hot chocolates they serve. The hostesses and bartenders are really knowledgeable and a ball of fun! Love cake? This is dessert heaven. Lunches are flavorful and the menu is varied enough to please all. The best time to visit is after an evening out and you want a special dessert. There are cases of beautiful cakes, pies and an atmosphere of a Parisian cafe. Cozy little tables and an awesome drink and dessert menu to please everyone. Enjoy! I ordered French Onion soup, Spicy Tortellini with chicken, and had Bosco for dessert. I thoroughly enjoyed each mouthful, and everything looked lovely! Kiella, my server, was prompt and courteous and made me feel so welcomed. Getting to sit outside on a lovely evening was a bonus! I would definitely go back when I am in the area again!! I LOVE THIS PLACE! So this is totally my new obsession. I've visited the one I. The airport but never thought to try the midtown location.I went to a birthday party over the weekend here. It was as if I stepped into Europe somewhere. From the wall sculptures, paintings and projector screens this place is simply breathtaking. The airport location promotes mostly a brunch menu so I was under the impression that breakfast food was all that they offered. Not the case. I got the smoked salmon and bow tie pasta. The flavors were aromatic before I took a bite! The vodka alfredo sauce was fresh and quite tasty. The salmon was cooked perfectly. It was seasoned to perfection. Some places over season or under season. Cafe intermezzo does it just right. I got the orange dream cake and I'm so glad I did. It was fluffy, bursting with orange zest and not too sweet. I absolutely love this place and can't wait to go back! I used to date a European guy. He was over here all by himself - all his family was waaaaay back across the pond and then some. One night he was feeling particularly homesick. I decided to take him to Cafe Intermezzo in Dunwoody. Since it's billed as a European-style coffee house, and I had heard him speak of how much he enjoyed the coffee houses back home, I thought it might seem a little familiar to him thus alleviating some of his homesickness. Boy, did I ever hit a home run with that one. He kept looking all around him marveling at how similar it was to the cafes in his country. Even the menu was spot on, especially the Turkish coffee, which he said tasted just like his mother's. The trip to Intermezzo lifted his spirits immeasurably. I had been there prior to that night, but this was the first time I realized how authentic it is. 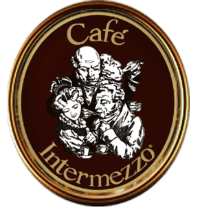 So, if you want to experience a true European-style coffee house, visit Intermezzo. And it doesn't necessarily need to be for a date - go there with your friends, go there for business, go there by yourself if you want. The servers are always incredibly nice and knowledgeable, and if you could bottle camaraderie you could take the atmosphere with you. Highly recommended. Having been to many German Konditoreien (dessert café) Café Intermezzo really is a gem. The coffee is fantastic & the selection of cakes and pies is wonderful, but the staff are what elevate the experience! They are pleasant, efficient & don’t rush you to leave! Looking forward to going again during my next visit to Atlanta! I'd been to the Perimeter location before but last Friday was my first time at the Midtown. You can't go wrong with Cafe Intermezzo if you want a casual yet upscale dining experience. We had just flown 5 hours from the west coast and wanted a satisfying meal. CI hit the spot! The slow-beef is so good. Like Grandma wrapped you in a warm hug. It's so tender and juicy on a mound of mashed potatoes. That's comfort food, man! I just really enjoy food like that and I was happy they had it. Really hit the spot. Such a cute little gem! I wish they had this place in Houston! This is the first place that I have seen offer a Peanut Butter Hot Chocolate!? What?? Peanut Butter is LIFE and I could not resist trying such a concoction. I am so glad I did. It was literally the best thing ever. I seriously assumed that the drink would be stingy with the PB and only offer a "dollup." I was pleasantly surprised. The PB is alll along the rim of the cup and actually inside of the cup along with the foamy milky goodness & whipped cream. It was great. I highly recommend. I also had the standard breakfast plate - it was good, but the true bragging rights belongs to the dessert and the drinks. I got the strawberry cheesecake, which is actually a pretty hefty, rich slice. Very good. Love the whole ambiance of the place. Cute, sophisticated, classy, chic. All of that and more. Looking for a calming, but cool and fun experience, you gotta check this place out! Beautiful ambiance! Great desserts!!! Can’t wait to return! Intermezzo Cafe was Devine!!!!! I loved my Beet Root Salad!!! I will be back!! Cafè Intermezzo is a wonderful place! I enjoyed my Cafè Intermezzo Hazelnut. I enjoyed the ambiance and the service! Can't wait until my next experience here. Our waiter and other staff members took care of us. First time visiting, so many great choices. I had wonderful Hot Chocolate Deluxe, and Egg Benedict Traditional. Was very yummy and work checking them out. I always said one day I’ll stop in. Happy today was the day. Thank You! Love love love Intermezzo! Especially at Avalon! Cafe Salzburg is the best! Love it! Staff is very friendly!! Wednesday is ladies night!! Love their food!!! I think this place have European style. Staff is very friendly, knowledgeable (when it comes to their menu). Just simply love it! Definitely will come again. My fave place to meet up with friends. Nice atmosphere and friendly employees. Perfect Date Night! Love this place. Excellent Service!! Love that this place is open late, has great food, desserts, coffees and drinks. A really nice environment to take your date after a concert or dancing, and quiet enough to actually hear each other talk! It's mature and young and hip at the same time. Came in for desserts after our anniversary dinner and we had a great time! We sat at the bar and our bartender/server Margarita was the best! She was extremely friendly and professional! We sat down and she served us two ice waters right away as we took our time deciding on desserts and after dinner drinks. We walked over to the desert displays which were AMAZING!! Id like to consider myself quite the dessert connoisseur and these were mind blowing! I selected the banana chocolate cake and an ice cold glass of milk to go with it. When I told Margarita what I wanted, she asked if I wanted it warmed up. ummmm YES PAHHLEASSSEEE! This may have been the third best choice of my entire life - and all thanks to the recommendation of Margarita! You will not be disappointed with this awesome place and I highly highly recommend it. After living in Atlanta for the past 5 years, I can finally say I've visited the most popular location of Cafe Intermezzo. I've dreamt of stopping in every time I pass by but never had anyone to go with up until recently when my mom visited and we had a taste for crepes after leaving the High Museum. I've visited Cafe Intermezzo once before at their Dunwoody location and can't remember for the life of me what I ordered so I'm going to count this as my first official visit. It's intimate, dim lighting, and private which I why I recommend coming with someone - preferably a date but their were groups celebrating birthdays so it works for patrons. Parking is located behind the restaurant in the Loews. Don't forget to bring your ticket with you as the restaurant needs it to validate. We arrived around 9ish and it was pretty busy which was expected considering it was a Friday night and this location closes at 2am. I mean it's on Peachtree Street which has several clubs & lounges so anyone a place that's quiet, intimate, or after dinner dessert is coming here. We arrived around 9ish and the place was pretty busy but it didn't take us long to be seated. Maybe 5 minutes. And you have the option of sitting inside or out. We opted for first available. As I mentioned, the atmosphere is intimate - similar to a cafe in Europe so you may have to hold your purse in your lap or place it on the floor; hopefully you're not superstitious. The beverage list is pretty extensive from coffees to wines to cocktails so I would suggest asking your server what drinks would pair well with your meal or dessert. If you're not ordering food, try one of their signature cocktails. Since we came for crepes, I ordered the Nutella & Banana Crepe w/ Cafe Dolce. Mom ordered a Seafood Crepe. We both enjoyed our meals. The edges were thin and the middle stuffed with all the goodness I expected. They did not skim on the bananas or spread. Staff was great. I'll be back soon - I heard that have a special menu for brunch that I'd love to try. Excellent place for a bite, coffee, drink or desert. The decor is very traditional with lots of wood, a personal favorite. It is frequently crowded, but when a place is as good as Cafe Intermezzo it's understandable. Unfortunately, sometimes the service suffers slightly. The outdoor seating on Peachtree is awesome. A local favourite for coffee, hot chocolate, and dessert in Midtown Atlanta--especially in winter weather. Their menu of hot drinks is extensive and includes everything from Mexican Hot Chocolate to Bailey's coffee. Their cake display has dozens of options, including cheesecakes, and their staff is enthusiastic about giving you a tour of the options. The great ambiance of the cafe makes the experience even better: it is often busy, yet feels cozy and romantic. Their outside patio is great for people watching on Midtown, and their inside area is romantic and allows for conversation. Very friendly and inviting staff. We got dessert here one evening and it was very enjoyable. One of the ladies was patient and told us all about our dessert options. The cake I got was incredible. Our waiter was warm and friendly. I look forward to coming here again. What a fantastic experience, great service, great food, and great recommendations. We went there as a group of eight, and the atmosphere and feel were both marvelous. I ordered the spicy ravioli with shrimp and it was a glorious experience. Pasta was great, just the right amount of cheese and red pepper. Not spicy compared to the spicier things in life, but a refined amount, just enough to be categorized spicy. Love the ambiance of this location. You have multiple options from their endless drink menu. Their espresso drinks are absolutely amazing. They have plenty of indoor and outdoor seating. My only complaint is that parking is ridiculous at this shopping center. They are in the same shopping center as Eclipse di Luna, Alon's, Sage, Mckendrick's, and The Brass Tap. Awesome paninis, pastries, and the best coffee in the airport. Best place in alllllllll the land (aka airport) for a Blue Moon and black bean burger. Mhmmmmmm. The spicy tortellini with shrimp is heaven. Best cheesecake in town creme brûlée it's one of the best. The coffee is amazing, especially the one with a lot of chocolate ;). The food is really good too, but large portions. Don’t forget to leave room for dessert! The coffee is AMAZING, and the red velvet cake and all the cheesecakes and the egg benedicts!! Everything is amazing in this place! Great for brunch, lunch or tea time. I loved the place! Divine Cheesecake! Coffee is Awesome! We had the chicken salad croissant & cheeseburger for lunch & then of course cheesecake for desert. Food is wonderful & staff is super friendly. Beautiful place. They even validate parking for you! On a side note...I love that the bathroom teaches me French...lol. This is a Must Stop for us when we hit ATL. Our waitress was a joy. I didn’t catch her name, but when she came by to clear the table I snatched up my coffee before she could and looked at her suspiciously. No joke. She was great, and the food was primo. I had the seafood dip and tortellini. I’d sell my first-born for that seafood dip. Great service. Our waitress was very friendly and attentive. Went there for dessert and absolutely loved it. Can't wait to go back! Parking is also validated if you use the parking garage. Atmosphere was warm and exciting. Great experience all around. Chocolate mint cake so delicious and the white hot chocolate creamy and refreshing. Will be back soon. And, our waiter was funny and nice. Amazing. The manager Diana is such a sweetheart. They make sure we are well taken care of whenever we go. Cafe Intermezzo is delightful. The drinks menu is fabulous, split among various coffees and teas, coffees with alcohol, cocktails, and liqueurs. The desserts are just wonderful. The process for getting dessert is going to the cases - one contains cakes and the other cheesecakes - and letting a staff member know what you'd like. Then you'll have a card stating your order that your server will take when you return to your table. The process works well. There is good people watching out the windows, too. This is THE place to go if you love coffee and desserts. Although we went there for brunch, we were seated straight away Sunday noon. I ordered the smoked salmon Benedict which was delicious! It was one of the best tasting hollandaise sauce I've had and the English muffin was the perfect amount of crunchy. Awesome espresso. I had a great experience being served by Ryan the bartender. He made my visit enjoyable and I will come again. Had breakfast here on March 25th and it was the best decision my friend and I made. I had the croque madame and the caffe intermezzo cappuccino. I requested my egg on the croque madame be overeasy with the beschamel on the side. So delicious. Service was great! Our waitress was attentive and patient as I asked her plenty questions. After breakfast we had a dessert tour and I ordered a slice of coconut creme cake. I don't particularly care for dessert, but this cake was good.Next time I'm in ATL, I'm coming back. This place is pretty unique. Food is great and the dessert is even better. Ordered a burger and topped it off with a Oreo cheesecake- both were amazing. Will be back! Been here for lunch, brunch and now late night! Obsessed with their crepes and cakes. Some of the best French press coffee I've ever had. Beautiful decor, amazing food and great service. Never, EVER disappoints! I have been to the cafes in Paris...this is as close as you can get to it in Atlanta. Coffees are wonderful. Service was perfect. Sat out side and felt like I was in Europe. The desserts are wonderful. Good food and great service at the bar. Cheesecake is great and so many to chose from. If you are ever in downtown Atlanta a great place to try. I was visiting Atlanta and a friend of mine recommended this place. I made an advanced reservation on yelp which helped because the place started to get very busy. The french toast was amazing. The hot chocolate was decent and the pastries were amazing too. 5/5 just for the ambience and service. So good! Try the hot chocolate and Nutella crepe yummmy! I went to this lovely little cafe craving for something sweet, and I was surprised to see the variety of cakes they had in the display! Firstly, the ambiance is beautiful! The decor and the lights made me feel like I was in a historic cafe somewhere in Europe. Secondly, they have an enticing menu - lots of teas and coffees and munchies to choose from. My friend had a seafood crepe and she exclaimed that it was one of the best she's ever had! I, on the other hand, headed straight for the cakes. I had the Reese's cheesecake, and it was very very satisfying. I've had a few lovely meals at Cafe Intermezzo and many great cakes! This is my "go-to" nice restaurant as it never disappoints and is in central walking-distance in midtown. For any occasion, choosing cake from their grand selection is a treat! Fantastic atmosphere, great coffee, food, and cocktails. Breakfast lunch and dinner served all day. The carrot cake and heavenly lemon torte are my favorite pastries. Like a little slice of Europe. Excellent coffees with a selection for everyone's different tastes. Friendly service and delicious food. Could spend all day here trying all the different drinks and and cakes. Café Intermezzo is a coffeehouse and dessert destination originally based in Atlanta. Every time I would visit the city, I loved stopping by Café Intermezzo. When I learned they expanded and opened a location in Plano, my level of excitement was the proverbial "kid in a candy store." Situated in Shops of Legacy, Café Intermezzo is a great addition to the lifestyle center. Stopped by after work and took cheesecakes to-go. Will be coming back for a sit-down meal, dessert, and night cap. So happy they are here!! I have to say that I was impressed! Great food, amazing coffee and to die for desserts. Went for coffee and dessert one night to try it out and came back next day for breakfast! Try the "tres leches" my favorite from the menu although the variety was amazing I'll have to go back and try them all. We tried four of the coffees and one of the teas (French pressed by the way) and each one was an experience! The service was top notch from a warm welcome, consistent but not overwhelming follow up to opening our door on the way out! We found our new spot! This is the coffee house my heart has always yearned for. Service was amazing, and there were multiple people aside from our attentive server ready to offer assistance if needed. In the spirit of European food & drink, nothing was rushed and we were able to enjoy the ambiance and treats at a relaxed pace. My husband and I both ordered cappuccinos and a slice of cake, and let me tell you, the cappuccinos were fabulous. The cakes we tried (don't recall the names) were delicious as well. The decor, music, lighting, service, caffeine, and sweets were all perfect together, especially for a post-dinner, post-walk around the area. Definitely recommend!